Spice up your hummus game with Indian spices and lentils to make dal hummus. A most perfect dip and spread for healthy, vegan, snacks and lunches. Spread this dip on wraps or use it to plunge in fresh vegetables and bread. Good old hummus. Reliable hummus. A constant feature on our grocery shopping list this ubiquitous chip dip was, once upon a time in the UK, rarely encountered outside of the kebab shop. I do however vaguely remember at least one incense-permeated vegetarian cafe in the mid-1980s serving it with the likes of chips (French fries) and macaroni cheese. Those were odd times. I wasn’t tempted. If you are under age 28 you will never have known such culinary deprivation. But yes, before 1990, it was just Waitrose (a store only in England at the time) and specialist stockists who carried those familiar plastic pots of pureed chickpeas. Those days of 100 per cent mortgages and endless sunny summers are long gone but our taste (mine and the UK’s) for this chickpea, garlic, lemon and olive oil spread has only grown keener. And now, 2018, almost everyone eats hummus. At least in the UK. Seemingly the UK is the epicentre for hummus consumption in Europe. Or at least 40 per cent of us have a pot of it shoved in the back of the fridge. But, as you will have read, there is a bit of a chickpea crisis. And, consequently, the price of our favourite dip has edged up 30 percent since January 2017. That’s quite a hike. What with the chickpea crisis and the avocado crisis, what’s a hipster to do? DIY it, of course. At least the hummus part. On this here blog you will find My Perfect (-ly Smooth) Hummus as well as various hummus-like dips ( I really like this version of hummus, although there isn’t a bean to be seen), but it’s been ages since I offered another. I do play around with flavours all of the time, despite having an extremely low tolerance for the chickpea (don’t ask), but basically it is still variations of the Middle Eastern staple we know and love. Until I tried a dal hummus at Waitrose. It was so good that I thought, I will need to make my own so I don’t empty my wallet every week at Waitrose. Er, I still empty my wallet there, but just not on hummus. The Waitrose version doesn’t tell you what spices it uses but I had a fair stab at it, basically throwing in most likely spices as well as tomato puree. At first I tried to make it without adding chickpeas but found it far too thin to pass off as a dip. Tasty, though. So, I’ve since added chickpeas, served it at work and had a colleague say it is the best hummus she’s ever had. (thanks, Issy!). Feel free to play with the spices and their proportions. The main thing is to make a lentil and chickpea mash with at least a slight Indian accent. I took it into work garnished with lightly roasted Chantenay carrots and cauliflower, plus a small palmful of fresh dill and a scattering of kalonji (black onion) seeds. Just as it is with best olive oil and veggies and bread for dipping is perfect, too. But please, please, please: no French fries and macaroni cheese. Spice up your hummus game with Indian spices and lentils to make dal hummus. A most perfect dip and spread for healthy, vegan, snacks and lunches. If possible, use whole spices. I think it makes such as difference. Spread this wholesome dip on wraps or plunge in fresh vegetables and pitta bread. 1. Heat a small skillet over a low-medium heat and add the spices, curry leaves, seeds, garlic and ginger. Shake the pan and heat everything until it all smells lovely and spicy. Remove from the heat and grind to a powder in a coffee/spice grinder, mini food processor, or even a pestle and mortar if you are very strong. Adding some of the oil and sea salt will help with the latter. Set aside. 2. Cook the lentils thoroughly but not to a mush, if possible. Drain very well , leave to cool for 15 minutes, and add to the bowl of a food processor, along with the chickpeas, tahini, tomato paste, lemon and spices. Blend very well, adding up to 50 millilitres of olive oil through the tube of the processor. Season to taste. Serve with more olive oil swirled on top and maybe roasted spices or herbs, like dill or coriander/cilantro. Enjoy in salad-stuffed wraps or rolls, with chopped fresh vegetables, roasted vegetables and pitta chips. this should keep for five days in your fridge. I can’t believe I’ve never thought to add lentils to hummus before-genius idea! I love all the spices you’ve added~I think I have everything except dried curry leaves. Such pretty pics too! I want to dive into a ginormous bowl right now!!! Ooh, I’m so happy you like it! I can’t take credit for the idea but the recipe is pure food to glow. Thanks so much for taking the time to comment, lovely lady. You’re closer to the appropriate weather for dips and picnic food. We are expecting snow this week! Hummus to a whole new level. Genius and delicious!!!!!!! Wow…This is amazing..Bookmarked it..It is looking absolutely delicious !! Indeed! Basically it is a big ol thick dal curry! What a gorgeous recipe, in both colour and flavour. I sometimes make hummus with black beans or edamame, but I’ve not yet tried making it with lentils. Such an obvious swap, though. 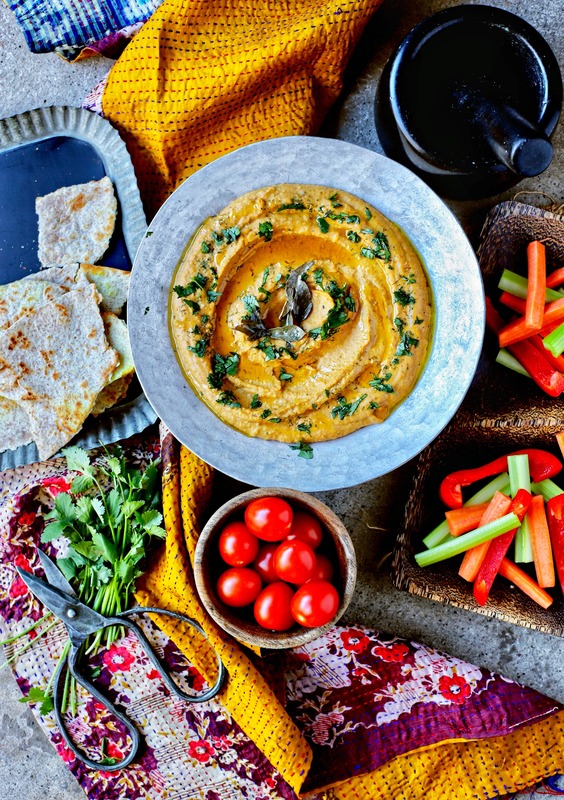 I’ve pinned and shared and hope to see this dal hummus on a party platter (and in my face!) quite soon! Love hummus, love dahl therefore = perfect recipe! Thank you! This looks absolutely stunning! I’m off to stock up, what with the snow and now I find out about this chickpea crisis, time to get some more hummus!! I trust you are well stocked with hummus, if not bread eggs and milk (none in our neck of the woods, that’s for sure)! ‘Hi’ back to ya, Lady! I hope you are as busy as I am. Life is good that way. Never to busy to pop in to comment on my favorite food blog. PS – I have gotten 1st and 2nd grade kids to eat veggies out of their school gardens. Onions and beets and mustard greens, even kohlrabi — many tried them for the first time. Can’t hardly believe it!! wow awesome looking very spicy and hot . love it ………………………….. Thank you for sharing this wonderful recipe. I myself have been experiementing with making hommus with different flavours and I have been pleasantly surprised at how lovely they taste. Thank you again. This looks so good, yummy, I have to try one of them…. what a lovely looking hummus…beautiful colour, and sounds amazing! Can I use only dal, without chickpeas? Thanks Kellie! I tried it that way and it turned out to be in fact too dry. Maybe I drained it a bit too much. It was sooo delicious nevertheless that I can’t wait to make it again!